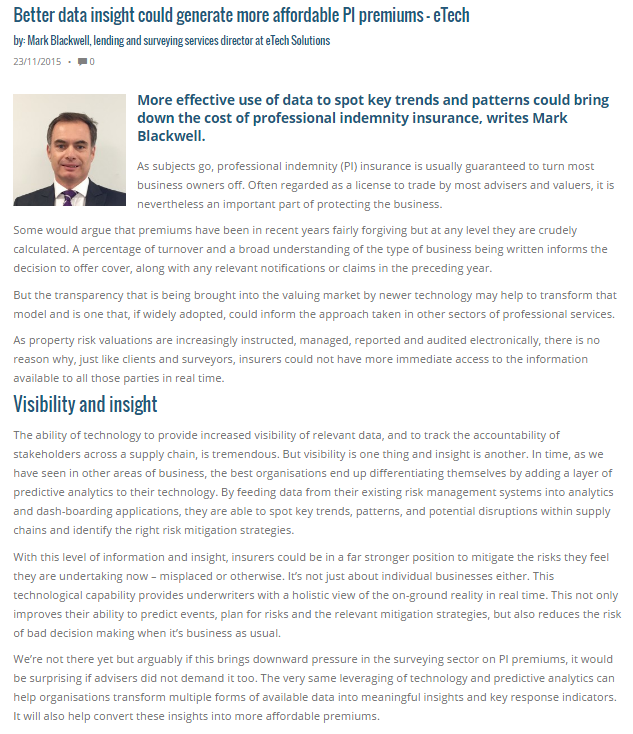 More effective use of data to spot key trends and patterns could bring down the cost of professional indemnity insurance, writes Mark Blackwell. As subjects go, professional indemnity (PI) insurance is usually guaranteed to turn most business owners off. Often regarded as a license to trade by most advisers and valuers, it is nevertheless an important part of protecting the business. Some would argue that premiums have been in recent years fairly forgiving but at any level they are crudely calculated. A percentage of turnover and a broad understanding of the type of business being written informs the decision to offer cover, along with any relevant notifications or claims in the preceding year. But the transparency that is being brought into the valuing market by newer technology may help to transform that model and is one that, if widely adopted, could inform the approach taken in other sectors of professional services. As property risk valuations are increasingly instructed, managed, reported and audited electronically, there is no reason why, just like clients and surveyors, insurers could not have more immediate access to the information available to all those parties in real time. The ability of technology to provide increased visibility of relevant data, and to track the accountability of stakeholders across a supply chain, is tremendous. But visibility is one thing and insight is another. In time, as we have seen in other areas of business, the best organisations end up differentiating themselves by adding a layer of predictive analytics to their technology. By feeding data from their existing risk management systems into analytics and dash-boarding applications, they are able to spot key trends, patterns, and potential disruptions within supply chains and identify the right risk mitigation strategies.